Red wine, tomato sauce, coffee. Each of these items strikes fear in the hearts of homeowners with carpeted floors. Unfortunately, kids with sticky fingers and pets with messy paws — along with the occasional accident — make spills and stains an inevitable part of life. 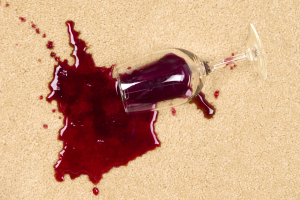 Fortunately, maintaining a clean carpet is easier than ever before. Shaw Floors has created a Carpet Stain Center application for the iPhone, iPad and iTouch that prepares you for the unavoidable. Mud tracks through the living room? Kool-Aid spilled in the den? Not a problem with fast, clear access to detailed stain removal tips for hundreds of the most common stains. Red Wine: Apply detergent solution (1/4 teaspoon clear hand dishwashing soap and 1 cup warm water) with a damp towel; leave on for three to five minutes (blot, don’t rub). If stain is not removed, apply a hydrogen peroxide/ammonia solution (1/2 cup of hydrogen peroxide and 1 teaspoon household ammonia) and let stand for two to three hours under a weighted sheet of plastic wrap (repeat as needed). Once removal is complete, apply white vinegar to neutralize the area, then apply water with a damp towel to rinse. Blot, then finish with a weighted pad of white paper towels. Gum: Scrape or blot up excess spill. Freeze with ice cubes. When hardened, shatter with a blunt object, such as the back of a spoon. Vacuum chips before they melt. Peanut Butter: Scrape or blot up excess spill. Apply detergent solution with a damp towel (blot, don’t rub). Apply water with a damp towel. Blot, then finish with a weighted pad of towels.